Hi all. Been a long time lurker on ausbonsai and I have learnt alot from everyone and the time has come to make my first post. 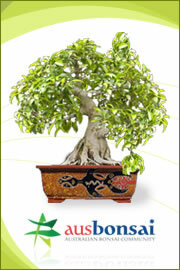 I recently received a large ficus yamadori (which if I'm correct is a port jackson...?) I believe it would suit as banyan style as it is rather wide with a number of aerial roots. I'd like to hear your opinions on how I should go with styling this big boy as I need a bit of a nudge forward. Last edited by Bougy Fan on March 7th, 2018, 7:13 am, edited 1 time in total. G'day Huzu and congratulations on your first post! I agree that a natural style fig would look good. It has natural movement to the right so I'd be emphasising that. Following is a rough silhouette that would be pretty achievable. You should cut the branches back to increase ramification while keeping in mind the rough shape you want to achieve. Wire the branches to move them into position or use guy wire to pull them down. Keep us updated on the progress. Stevens silhouette looks about right to me. Giving advice from a picture can be difficult sometimes. How patient are you? Personally, I would wait until next growing season, defoliate it and them post a picture. It will give us a better idea of what's going on because it looks as if there may be a need for some heavy pruning in there. Steven wrote: G'day Huzu and congratulations on your first post! Thanks for your input Steven. I was thinking something along those lines but was going to put the apex in the centre. I like your idea better as it will look more natural and less symetrical. Waltron wrote: Stevens silhouette looks about right to me. I'm rather patient with my trees as I have loads of others to keep me busy if I feel like working on some. I will defoliate once the growing season comes around again and post another picture. When the time comes to remove the leaves, will I be cutting the growth tips off at the end of the branches or leaving them for strength? Im still a bit of a noob when it comes to fully defoliating.. Such a big tree with soo much potential, such an unreal find! Can't wait to see the progress on this one. kelson t wrote: Such a big tree with soo much potential, such an unreal find! Can't wait to see the progress on this one. It will take lots of time and patience but one day this will be a beast of a tree and definitely the centre piece in the garden. I will grab your help when I repot though it's freakin heavy!